It's a great day! In a new month, I welcome you into a new month- the month of March. I was excited about February, and thank God it was a great month. This is March! I already feel super-excited and I believe it's another spectacular month. In fact, I already prophesied and named the month :March-Makeover. Well, I am not a 'prophet' but I am a child of God and I believe God is Able! 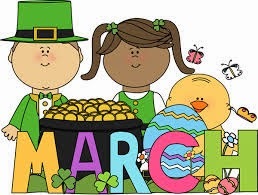 March is a great month! I will show you why! March is the 3rd month and I believe 3 stands for perfection or completion. (As a matter of fact the Lord Jesus did rise again on the 3rd day not 2nd or 4th!) So I believe everything God has started in your life will be perfected this month. It is the beginning of the last month of the 1st Quarter of the year. So I believe everything God has promised, every goal you have not been able to achieve yet in this first quarter will find speedy completion this month. I also believe this is the month of divine Make-over. Everything you have lost in the beginning of this year or in the past, will find speedy fulfillment in Jesus name! Welcome to the Spectacular March-Makeover where your March into greatness is unexplainable yet undeniable.